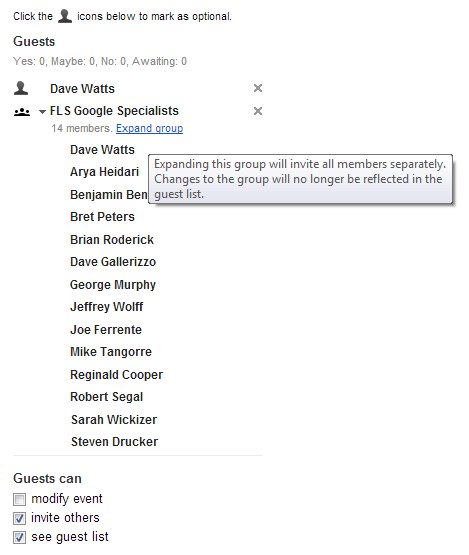 Fig Leaf Software Blog: Calendar events now update based on Google Groups membership changes! Calendar events now update based on Google Groups membership changes! I've been a big fan of Google Apps for a long time, and wouldn't go back to Exchange for all the money in the world. But Apps has had its issues. One of those, for me, has been how group membership is handled. Groups in Apps can be used for two things: distribution lists, and permissions. You can send an email to a group, of course. You can also invite groups to Google Calendar events, and share documents and folders with groups in Google Drive. For a long time, though, you could use groups for permissions, but the permissions didn't change when group membership changed. In other words, if you were in a group and I invited that group to a recurring event and shared a document with that group, you got the invite and could access the document. But if you later were removed from the group you still got invite updates and could still access the document. On the flip side, if someone else was later added to the group that person wouldn't get the invites and couldn't access the document. This changed a long time ago for Google Drive - back when it was called Docs - but until now, it was still true for Google Calendar. But that changes today! Now, when Google Calendar invites are sent to members of a group, the attendee list will change as group membership changes. Dynamic group membership is now consistently handled across Google Apps!